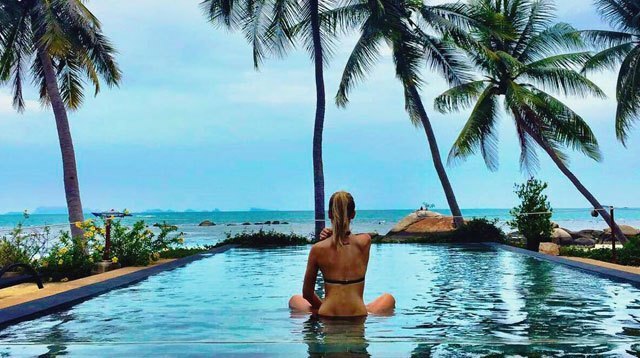 Instagram can be a major source of wanderlust—embrace it! Take a cue from these incredible travel photographers and book a trip to swim in Fiji or relax in a hot pool in Oregon. Whatever your taste, there's something for every jetsetter. If you love the great weather, delicious food, diverse crowds, and colourful backdrops of Southern California, show your love at the famous "Love Wall" in Culver City. The mural was created by artist Curtis Kulig, who started the "love" mural campaign featured in different cities such as Paris and Berlin, according to Los Angeles Magazine. Chances are, this destination with nearly two miles of waterfalls isn't on your travel bucket list....yet. Iguazú Falls is a must-see if you've ever wanted to visit Argentina, or if you are simply entranced by the natural wonders of the world. Located on the border of Brazil and Argentina, the waterfalls are 1.7 miles long and 269 feet tall, making them the largest system of waterfalls in the world. Care to visit a hidden paradise? Try the Philippines—we suggest the municipality of Badian Cebu in particular. Dip into the refreshing water and swim near waterfalls, or purchase beaded necklaces and bracelets at local shops. Portland tends to be the hotspot destination in Oregon, but to truly get away and relax, you'll want to visit the Umpqua Hot Springs in Glide, Oregon, above the North Umpqua River. At the site, there are three hot pools plus campsites and picnic tables—and a decent (or indecent?) number of naked tourists. Viva la vida.